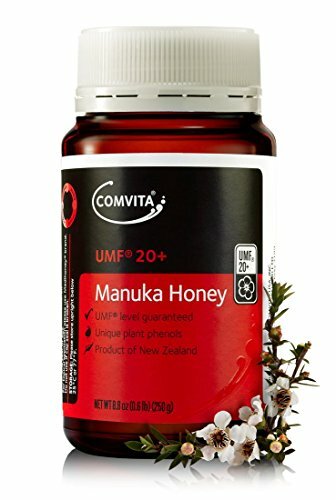 Comvita Certified UMF 20+ Ultra Premium Raw Manuka Honey (MGO 829), comes from the nectar of the Manuka flower in the pristine forests of New Zealand. Limited crop production makes UMF 20+ in scarce supply. Traceable from hive to shelf, each BPA-free jar of creamed Comvita Manuka Honey is non-GMO, Halal, and Kosher certified. Manuka Honey is known to support digestive and immune health and help soothe coughs and sore throats. CERTIFIED UMF - THE GOLD STANDARD Every batch of Comvita Manuka Honey is independently tested by the UMF Honey Association. Only UMF measures the three signature compounds (Leptosperin, MGO and DHA) found in genuine Manuka Honey. Note that Manuka Honey brands labeled as "Active", "Bio-Active", "20+" (without UMF), or "KFactor" don't comply to the same level of quality standards. BENEFITS & USES Manuka Honey is known to support digestive and immune health and help soothe coughs and sore throats. Ways to use Manuka: Enjoy a delicious spoonful in the morning or before a workout as a natural energy source. Add to your tea, toast, yogurt, or smoothie as a superfood. Use as a DIY face mask as part of your daily beauty routine. DID YOU KNOW? Comvita supplies medical-grade (sterilized, high UMF) Manuka Honey, which is administered topically for its antibacterial properties to treat wounds and burns in hospitals and wound care clinics. COMVITA HERITAGE From humble beginnings in 1974, and now with over four decades of perfecting our beekeeping craft, we are proud to be the trusted leader in Manuka Honey. We have over 40, 000 hives and are committed to growing relationships with our beekeepers. We give back to the community through the Trees for Bees research program and many other sustainability initiatives. If you have any questions about this product by Comvita, contact us by completing and submitting the form below. If you are looking for a specif part number, please include it with your message.